Here are a few words to explain why choosing the best standing desk may be vital for your productivity and health. We all know the great benefits that physical activity has on our bodies and our health. What may be shocking is finding out the actual physical damage that can be done by sitting at a desk for 40 hours a week at your job. As the technology industry grows and more and more Americans are finding themselves employed in an office setting that places them in front of a computer screen full time, doctors are reporting a great increase in medical conditions and diseases that are a direct result of simply sitting too much. Dr. James A. Levine shares that the way to combat the dangers of sitting too much is to simply find opportunities to get out of your chair and stand during the day. Thankfully, making the switch from sitting to standing is an easy one thanks to the incredible new standing desks on the market today. Making the switch from sitting at a desk to standing at one has been shown to not only improve health but also has a direct impact on the quality of work being completed. A stand-up desk is just like how it sounds: a desk that allows you to stand and work instead of sitting to complete your tasks at the office or at home. These desks are quickly becoming popular choices in a variety of industries, mainly because of the great employee satisfaction rates and increased health and work efficiency benefits. There are several different kinds of desks, which offer a variety of features to fit most needs. 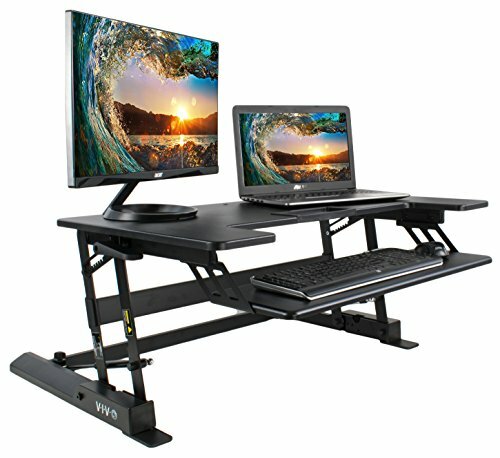 Most tables and standing desk converters are adjustable, allowing them to be effective for a variety of heights and body types. They are compatible with most pieces of technology and are often seen in offices where the owners and employees enjoy working with the latest tech gadgets while producing cutting-edge work. When a person who is used to sitting behind a computer screen every day begins standing to work, they notice the benefits quickly. It is important to note that adjusting to the physical demands of standing all day can take a little bit of time. Some people love it right away, while others prefer to sit for a small portion of the day and spend the rest of their time standing. When an office outfits their space with these ergonomic pieces of furniture, it encourages more communication and team building among employees, creating a culture of company loyalty and camaraderie. The cardiovascular benefits of standing versus sitting all day are huge. The risk of contracting any form of cardiovascular disease skyrockets in relation to how sedentary a person is. As soon as a person becomes more active and spends more time standing and moving (even simply shifting weight from one leg to the other), the risk of cardiovascular problems decreases. Consider the average worker who spends their day confined to a chair behind a desk. They are likely sitting still for between six and seven hours every day, and if they eat lunch at their desk it may be closer to eight hours. Add in their commute by bus, train or car where they are again, sitting and that leads to a very sedentary life before even getting home and kicking back to watch their favorite television shows. Most people spend the majority of their waking hours at their place of employment. It just makes good health sense to turn that employment place into a place that also provides optimal levels of health protection. When employees are able to improve their health while at work, they will feel better, require less sick days and be able to give back to the company in numerous ways. Working at a stand-up desk has shown great results when it comes to stress relief. Even those who are not self-professed workaholics can feel stressed or overwhelmed from time to time at work. There may be regular deadlines to be met, stressful presentations to be made or any variety of difficult tasks to complete from day to day. It has long been known and accepted that physical activity is one of the best stress busters out there. It simply makes sense that adding more time upright, standing and moving about will have the same effects as a concerted effort to fit more exercise into the day. While standing at a desk is not the same as going to a yoga class or having a workout session at the gym, it does produce benefits of its own. Standing helps the circulatory and cardiac systems to flow properly, keeping channels to the brain clear and inviting a calmer, more peaceful demeanor. Many employers have begun offering these elevated desks to their employees, following the results of numerous studies finding an increase in productivity and work efficiency when employees stand more than they sit throughout the day. It makes sense that when one’s overall health and mental state improve, the quality of their work will improve too. Standing upright and moving more throughout the day helps in all facets of an employee’s work life. Especially when working in the fast-paced world of IT, design or development, the brain needs to be firing on all cylinders at all times. Getting up out of the sedentary seated position helps the brain to work optimally and new ideas and solutions to be plentiful. When a person switches from sitting to standing for only three hours out of the standard eight hour work day, they burn approximately an additional 750 calories per five day work week. At the end of the year, that equates to about eight pounds of fat shed from the body! Most people are always on the search for ways to drop stubborn pounds, and this is a quick and easy switch that can facilitate that weight and fat loss. It has also been noted that when employed and working at an adjustable standing desk, there is greater opportunity for physical activity. Simply walking around the office or to and from a neighboring co-worker’s workstation adds more calories burned and energy and health gained. The best standing desk is a personal preference. Ultimately, it must be comfortable, durable and make standing and working at it all day every day an enjoyable experience. There are many elevated desks on the market, so it is important to do research to find a quality desk that best fits your workplace and your individual needs. The Uplift Desk Company prides itself on creating ergonomic workstations that are comfortable and attractive. Minimalist in design, their desks fit into most workspaces seamlessly. They offer both corporate sales as well as sales to individuals. The Uplift line of products includes desks, desk converters, ergonomic chairs and other office accessories. Varidesk brand desks are incredibly easy to assemble, so you can get to work while standing right away. This company has created numerous products to promote an active workplace. Based in Texas, Varidesk was the recipient of the 2017 EY Entrepreneur of the Year Award. Their products are made of only the highest grade, quality materials and come with a generous guarantee and excellent customer service. The Flexispot company has been creating well known, effective and comfortable work solutions to help all desk workers get up out of their chairs and on the road to feeling great. Not only do they offer a top of the line adjustable standing desk and desk converters, but they also have a desk bike that allows the user to pedal while working! The folks at Apex Desk have one goal in mind: create quality products that will last, are effective and most of all, affordable! They realize that many desks on the market are out of the budget for many people, so they set out to change that. A standout product in the Apex Desk line is their standing unit for children. Most companies solely focus on the adult worker. Apex realizes that children spend many hours each day sitting at a desk as well and are better served while standing. Ergotron offers a wide range of standing work and classroom solutions. They have an excellent customer service team ready to help customers decide which desk to purchase and provide support at any time after the purchase has been made. Ergotron has workstations available to fit just about any existing desk, hold a variety of monitor weights and even fit a dual monitor set up. Ergotron products come with a 30-day risk-free guarantee. Evodesk is unique in that it offers the options of creating a fully customized adjustable standing desk. They lead the market in terms of creating products with sustainability in mind, using recycled materials and quick growing materials such as rubberwood and bamboo. Their electric adjustable desk offers power adjusting technology to create an ideal, comfortable workstation. Evodesk has designed their products in a modern, sleek fashion in an effort to appeal to a variety of industries. Many of their desks also boast hidden or pop up storage areas, solving the stand-up problem of having nowhere to store standard desk supplies. Autonomous is working hard to help make more and more offices efficient, ergonomic and modern. Their motto is “We help people work smarter.” and they do just that through the sales of their high-quality desks and accessories. The Autonomous desk is designed to encourage workers to spend part of the day sitting and part of the day standing. As a result, they are moving in a way that has been shown to improve health and boost work productivity. Their sit and stand desk is easy to use, comfortable and efficient. The Jarvis’ Company’s most well-known desk is called the Jarvis model. The Jarvis sports a bamboo surface and a strong steel frame. Users love the fact that this desk is incredibly quiet when adjusting it up and down. For the past four years, The Wirecutter named the Jarvis the best desk for standing workspaces. The Jaswig company is dedicated to caring for the environment. Through their membership with the 1% for the Planet organization, they are as passionate about giving back as they are about creating the highest quality ergonomic products available. Vivo has a product line that is dedicated to making the office as functional a space as possible. They have a wide variety of products available to suit the needs of most offices. Recognizing the importance of keeping employees mobile and active throughout the day, Vivo created desk frames, converters, and mounts that allow people to stand while working instead of remaining seated in a chair in front of a traditional desk. They pride themselves on their worldwide customer service and offer products at both the wholesale and individual purchasing level. There are many instances in which replacing a sitting desk with a full elevated desk may not be possible. 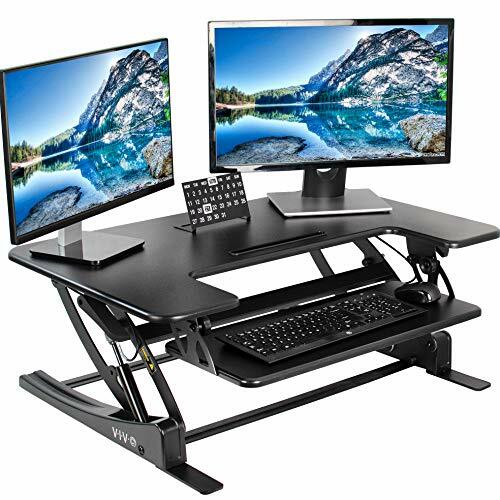 The perfect alternative is an adjustable desk converter! Desk converters essentially transform an existing traditional sitting desk into one that is able to be stood at. When a desk converter is installed, the footprint of the existing desk does not change, making this the ideal option for small offices with little room to move furniture around. 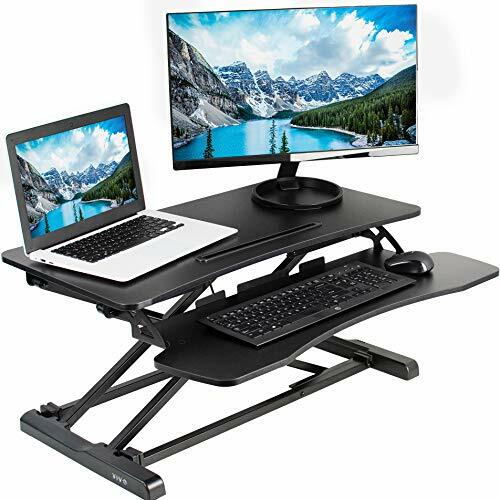 A sit-stand desk converter is also more affordable than full desks, making them an attractive choice for businesses watching their bottom line while still wanting to invest in their employees’ health. Electric converters are controlled by a mechanical motor. Instead of using physical strength to adjust the converter, users simply press a button and it adjusts to the user’s requirements. Ideal for workers who may otherwise be unable to operate a manual desk converter, electric sit and stand converters bring a greater level of accessibility to more people in the workplace. One of the main concerns with electric models is the fact that there are simply more parts that can break and cause problems. Finding a model with a good warranty is key. Floating platform desks have a mechanism that attaches directly to an existing desk and has a floating platform that lifts and rises up to create a single flat surface, similar to a monitor arm. Most floating platforms also have compatible accessory attachments available for a keyboard, mouse, etc. Floating converters do not have any dedicated task or workspace, so users are often forced to reach under the platform or around it to access items on their existing desk surface. Floating platform desks can also be adjusted to allow the user to push it back towards the existing desk if sitting for a short time is desired, which can be especially helpful when adjusting from a sitting to a standing workspace. Most of the adjustable standing desk converters that are manufactured fall into the category of the fixed double platform model. They offer adjustable height options with two fixed areas to hold a monitor and a keyboard. Many people who are new to the world of standing up to work have seen fixed double platform models and it is often the first kind of converter that most try. This type of model is reliably sturdy and easy to use. It does not have too many moving parts that can make an otherwise great design seem overwhelming and difficult to maneuver. Converters can appear to be bulky and awkwardly shaped, altering the appearance of the office space. Regaining control of your health doesn’t have to be a long, painful process. So many of us are already working hard for most of the week in front of a computer. Making the simple switch to a desk where you stand to do your work or the best standing desk converter has been proven to improve work performance and drastically improve the user’s overall health. It’s easy changes like this that will reap the greatest rewards, and there is no greater reward than good health.